The jig is up for the illegal digital billboards in L.A.!!! Finally, after 6 years of litigation, the digital billboards time has come. CBS Outdoor and Clear Channel Outdoor had one last chance to reverse the decisions against their illegal digital signs, and that was to have their case reviewed by the CA Supreme Court. This afternoon, that Court has officially denied review of the case. The case has run its entire course; it cannot run anymore. There are no more appeals left. No it's time for these illegal digital billboards to come down. The case is officially going back to the jurisdiction of the trial court Judge Green, who will issue the final order invalidating all the permits. Then the City will take action as required by law to see that these digital billboards are dismantled immediately. We all know that CBS Outdoor and Clear Channel Outdoor really, really like the money coming from these signs and that they will be very, very angry if they are forced to comply with the law and the courts. We all saw their letters, and we know that they will try anything to keep this racket going. But their claims are frivolous, and the City Attorney's Office today responded with a brilliant, succinct, and correct letter that denied, rejected, and/or disputed each of their contentions. (Copy attached) Legally, everyone knows they're dead in the water, and that it is time to take these digitals down. CBS and Clear Channel are also pushing for legislation that will protect their wholly illegal signs. Councilmembers Krekorian and Reyes have been the leaders in recent legislative efforts to preserve these signs, even putting forth a motion written by Clear Channel and even fabricating a constituent that supported the motion. Of course, any effort to preserve these illegal billboards is itself illegal, goes against the City's land use plans, and is a slap in the face of the residents of the City. That said, our elected officials continue to push, indeed rush, to get some law through that will save these illegal billboards. Instead of the City contemplating how to get some revenue from more digitals, the City should be contemplating how to recover the $500,000,000 in revenues that these corporations made from these illegal billboards, while also taking them down. That way we will have zero digital billboards and the money needed for LA's budget! Now is the time that we have to dig in and have our voices heard by the City. PLEASE EMAIL the key councilmembers and let them know that you don't want ANY digital billboard legislation being passed, or even considered, right now until all the ILLEGAL digital billboards have come down. That you want the current "visioning" group and legislative efforts to be postponed until the City cleans up the current digital billboard mess, which they should be able to do within a couple months. And that you want the City to act NOW, firmly and swiftly, to take them down! The City officials should also demand a full accounting of all the revenues made from these illegal digital billboards over the last 6 years!! Please reach out to them and let your voices be heard now! And please don't forget to sign the petition here: http://chn.ge/XJYnlo, and to get a friend or two to sign it as well. As if one letter threatening the City of Los Angeles with financial ruin weren't enough, Clear Channel had to send out multiple such letters to different officials and from numerous lawyers and law firms, just to make sure that the City gets their point that they really like the money that these illegal digital billboards make, and they will be very, very angry if these illegal billboards are removed. These additional letters are attached for your reading pleasure. Maybe Clear Channel believes that by throwing everything against the wall that something will stick? Or maybe they believe that by creating a mountain of paper and a chorus of different, angry, powerful lawyers that they will distract the City and the public from the stark, plain reality that it's finally time (after 6 years) for these illegal digital billboards to come down? If it weren't so sad, it would be funny. These characters at this mega-corporation Clear Channel are reminiscent of Lance Armstrong, when he would sue or threaten to sue anybody that accused him of cheating. Like Armstrong, the time has come finally for Clear Channel and their illegal digital billboards. And once we get these digital billboards down - which if we push our City officials could be a matter of a couple months - then all the king's horses and all the king's men won't be able put Clear Channel's illegal signs back up again. Instead of Clear Channel Outdoor threatening the City of Los Angeles with a baseless "damages" claim, the City of LA and its residents should be threatening Clear Channel Outdoor with an Unfair Competition Law claim and a class-action public nuisance tort claim. If the City truly needs the "funds" from digital billboards - forget revenue sharing, which would be but a drop in the ocean of the City's budgetary problems, and instead focus on a $500,000,000 lawsuit by the City and the residents of LA to recover the ill-gotten revenues and to repay the "damages" suffered by all of the affected neighbors of these illegal signs. In the meantime, if we don't stop our Council from passing new law that protects these illegal digital billboards from the Court's decision and that stops more digital billboards in our great City, then we will have to live with these forever. We are running out of time. Unless we can stop CM Krekorian and the other CMs that Clear Channel and CBS lobbyists have gotten to, we will have a dismal future "visual landscape" in Los Angeles for ourselves and for our children. In the "visioning group" regarding the future of the "visual landscape" of Los Angeles on last Saturday, CBS and CCO asserted numerous times that there were "numerous studies" that showed that digital billboards did not diminish traffic safety. Of course they haven't produced a single independent, scientific study about how digital billboards would affect traffic safety in general, or specifically how they affect now or would affect in the future, the traffic safety of Los Angeles. They've also failed to mention the latest study on the impact of digital billboards on traffic safety that was recently conducted in Sweden and published in the journal Traffic Injury Prevention, which showed the digital billboards harm traffic safety because they are too distracting. How can our Council be considering allowing the continuation of the illegal digital billboards and considering allowing MORE digital billboards without any scientific basis to do so? Can anyone in the Council say conclusively that digital billboards won't detract from the traffic safety and aesthetics of Los Angeles? For the last 12+ years, the City of Los Angeles' official policy has been against any new billboards, and any alteration to existing billboards, all in the name of improving the traffic safety and aesthetics of our communities? Why this sudden, dramatic, and scientifically unsupported change in the policy towards billboards? There's no basis in common sense or in science for allowing these signs. Could it be because Clear Channel Outdoor and CBS Outdoor are on the verge of losing the 100+ digital billboards that were erected in violation of our LA Municipal Code? Could it be because CCO and CBSO have so much power, money and influence that they persuaded members of our City government in the Council to do their bidding and to try to rush through a new law that will protect these illegal, and hugely profitable, digital billboards from the Court of Appeal decision? It can't be because the Council thinks that allowing these digital billboards will improve traffic safety or aesthetics. If this is a democracy with a rule of law, it sure doesn't feel like or act like one. We will only stop this madness if we continue to make our strong beliefs known to our elected officials, and if we continue to alert the press to the wrongs that are happening in our City government. If you have not already, please sign our petition at http://chn.ge/XJYnlo. If you've already signed it, please get another person to sign it as well. Many drivers say the large digital billboards flashing ads every few seconds along Bay Area freeways are just too bright and too distracting. A Swedish study published in the journal Traffic Injury Prevention concludes that digital billboards hold the gaze of drivers longer than two seconds. Previous studies have shown that anything that takes a driver's eyes off the road for longer than two seconds increases the risks of a crash. "This study validates what is common sense when it comes to digital billboards," said a statement from Mary Tracy, president of Scenic America, a national nonprofit group that seeks to limit billboards. "Bright, constantly changing signs on the side of the road are meant to attract and keep the attention of drivers, and this study confirms that is exactly what they do." The report will be presented to a national transportation conference in Washington, D.C., later this month and is sure to draw interest over the growing installation of these signs. Last month a three-judge panel ordered the removal of 100 digital billboards in Los Angeles, and Denver has banned them. The Federal Highway Administration allowed digital signs for the first time in 2007 after concluding they did not pose a significant danger to drivers. But a follow-up report is pending and could be released this year. California has no law banning the billboards and is one of 39 states that allows them. "We would need to review more research, so it's premature to call for a ban," said Jonathan Adkins, executive director of the Governors Highway Safety Association. "There is a role for digital messaging such as that employed by states to convey Amber Alerts and other safety messages." Caltrans has considered using digital ads on its electronic freeway signs as a way to raise more cash. And revenue is why more billboards are being installed in cities strapped for cash such as San Jose. There are more than 1,800 digital billboards nationwide, more than double the number five years ago. In the Bay Area, there are digital advertising signs on Highway 101 near Great America, IKEA in East Palo Alto and in Redwood City, on Interstate 880 near Marina Boulevard, on Highway 237 near First Street, on I-80 east of the Benicia Bridge and on Highway 85 at Almaden Expressway. Another is planned at the 280-880 interchange adjacent to the Valley Fair shopping center. While there is no data that indicates an increase in accidents caused by the Bay Area signs, many drivers are opposed to them. "Monstrosities" is what Merlin Dorfman of San Jose calls them, while insurance agent David Whitlock says he has found them a major distraction. "The brightness is by far too bright for at night," he says. "When the advertisement switches from a brighter color to a darker color, your eyes cannot adjust fast enough and you end up losing vision of the roadway." Officials with sign companies could not be reached for comment, but Bryan Parker, an executive vice president for Clear Channel Outdoor, told USA Today last year that "there's no doubt in my mind that they are not a driving distraction." Several years ago, a study by the Virginia Tech Transportation Institute concluded the signs did not pose a danger, but its findings have been challenged by critics. The Federal Highway Administration requires states to regulate the distance between signs and how long one image can remain on screen before changing to another. Last summer many South Bay motorists howled when a digital sign was installed off Highway 85 at Almaden Expressway. But criticism eased when the brightness was reduced. "I still don't like the sign," said Marge White of San Jose, who says she frequently sees drivers ahead unexpectedly slowing on the freeway and guesses they may be reading the ads. "But it's not as distracting since it's not as bright as before." Clear Channel Outdoor threatens the City of LA: "If you follow the Court's Orders, we will sue you for $100,000,000.00"
Fortunately for the City, the legal arguments in the letter have each either been already heard and rejected by Courts, or are plainly contradicted by well established precedent. Therefore, if the City follows the Court of Appeal's order and demands removal this ill-gotten digital billboards as it should, any suit brought by CBS Outdoor or Clear Channel Outdoor (who have sued the City numerous times before), will likely be dismissed at the outset. Hopefully the City does not fall for these shenanigans, and hopefully the politicians on the side of CBS Outdoor and CCO who have made motions in the last few months to preserve these illegal digital signs, won't use this letter of empty threats as leverage to push through a new law that would grant amnesty to these billboards. It's estimated that CCO & CBS have made an additional approximately $500,000,000 from these illegal digital billboards above what they would have made as traditional billboards. (CCO's letter says that the value of the signs is well in excess of $100MM. CCO is just being modest: the true number is too large and would embarrass them if they printed it. But fortunately, a thief cannot sue the victim for having the value of the stolen goods once the goods are returned to the victim. Likewise, CCO cannot sue the City for the potential value of digital billboards that are removed when those digital billboards were illegal from Day One. This is especially true when CCO would still walk away with additional hundreds of millions of excess revenue from these digitals, while at the same time the City and its citizens will walk away with absolutely nothing for having been subjected to this nuisance for the last 6+ years). Can anyone - even a Councilmember in CCO and CBS's corner - truly feel bad for these mega-corporations that the law has finally caught up with them and that they can't continue to make these same, illegally gotten, runaway profits? Can CCO argue with a straight face that if the illegal digitals are removed that CCO will be entitled to "restitution" or to "damages"? It is common sense and it is well-settled CA law that a party may not make claims for detrimental reliance or vested rights or otherwise claim a property right in something that was built pursuant to a permit that was issued in error or that was prohibited by law. One might wonder why CCO take can't a loss like a good sport, take their half-a-billion dollar gain, pack their digital billboard equipment up, and take it back to San Antonio? Maybe CCO and their parent company are so over-leveraged and in so much trouble (see article here) that they are desperate to keep making these runaway profits at all costs - even at the cost of the residents of L.A., who are also the target customers of their billboards. CCO doesn't have a moral or legal grounds to sue the City anymore. On the contrary, perhaps it's time for the affected neighbors of these signs, whose rights have been trampled and who have been unjustly subjected to these per se nuisances for the last 6+ years to join together and file a class action lawsuit against these companies to recover damages and restitution for what they've been put through. Below is an attachment which contains the letter from CCO sent Friday. Of course, CCO sent this threatening letter on the eve of the first meeting of the "Billboard and Visual Landscape Visioning Group", which occurred on Saturday, Feb. 23. This group's purpose is to discuss what the "visual landscape" of Los Angeles should look like in the future - whether or not there should be digital billboards in the future at all, and if so, how/where/when/for what/etc. If you care about the future "visual landscape", you are encouraged to attend. The meetings are not invite-only - they are held in accordance with the Brown Act, and therefore open to the public, and the public will have an opportunity to speak. While CCO and CBS are trying to use this group (and legislation that comes out of it (if any)) to retroactively legalize their illegal digital billboards, as well as to "divvy up" the City of Los Angeles in terms of where to plant more digital billboards in the future, others in the group wonder if the future "visual landscape" of Los Angeles should have any digital billboards at all. Those of you who care about L.A., and want to make sure that there isn't another backroom deal or a special law passed to benefit solely these mega-corporations and their illegal digitals, are encouraged to attend. The next meeting is on this Tuesday, February 26, from 6:30 PM - 8:30 PM in Room 525 (the "Rotunda Conference Room") at City Hall, 200 N. Spring Street, Los Angeles, CA 90012. The 3rd and final meeting after the one on Tuesday will be held on Thursday, March 7, from 9 AM - 11 AM in the same place. The invitation to the event is attached below. We already have 600+ signatures and the City Government cannot ignore our voices any longer! Last week, four Mayoral candidates spoke about how they would support the take down of all digital billboards in the City. This included CM Perry, who voted originally for the Krekorian/Reyes motion back in October. Looks like perhaps she has changed her tune. Hopefully she will keep that position going forward. Here's the video - the discussion around billboards starts at around 1 Hour, 17 Minutes (1:17) and goes until about 1 Hour, 23 Minutes (1:23). Here is a video of CM Krekorian at the Studio City Neighborhood Council meeting a couple nights ago. Listen carefully to what CM Krekorian says, and what he doesn't say. In response to the audience member, he concedes that he won't add digital billboard language to the current sign ordinance proposal going in front of PLUM on Jan. 22. However, he does say that he thinks that he can come up with a solution wherein the City will end up with less digital signs, less intrusive signs, less static signs, and community benefits in return for digital signs. This is the same thing he's been saying since October 2012. 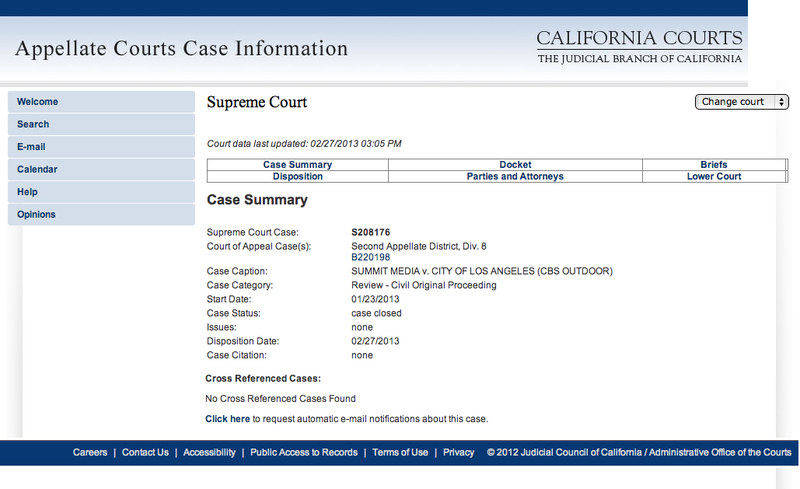 Even after an adverse, unanimous Court of Appeal decision that revoked all digital billboard permits; even after community outrage and a strong LA Times editorial imploring the City to not pass such legislation; even after negative press that exposed that Clear Channel Outdoor lobbyists wrote the CM Krekorian motion, and that Krekorian's staff had fabricated a softball question from a made-up constituent so that he could have a press platform from which to spread his message - he continues to hang onto the same goal. We don't want, nor do we legally deserve, simply "less" digital billboards. The City deserves NO digital billboards. The City Council got us into this mess by entering the illegal settlement agreement and allowing these 100+ digital billboards to be erected; now, thanks to the Court of Appeal decision that revoked all the permits for these illegal digital billboards, the City has the power to remove ALL of these digital billboards. Dear Councilmember Krekorian: We don't want "less" digital billboards. We want you to TAKE THEM ALL DOWN! 100%. And nothing less.